Two swans who fell in love at a bird sanctuary have been released back into the wild on Valentine's day. The birds, nicknamed Charles and Camilla, were taken into care by East Sussex Wildlife Rescue (WRAS) after being found separately with injuries. They were taken to the National Swan Sanctuary in Egham, Surrey, and placed together after the male showed "amorous signs" towards the female. They were released into the water at Sovereign Harbour in Eastbourne. The male swan was rescued on 14 January after being found at Sovereign Harbour in a pool of blood, with badly injured feet. 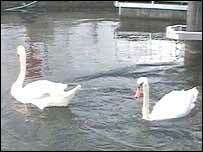 Because of the amount of blood he had lost, the swan was taken straight to a vet and put on a drip. After being transferred to the sanctuary in Egham his injuries were treated and his foot saved. The female was also found in a pool of blood at Hove Lagoon in December, having suffered a bad gash on her leg, thought to have been caused by broken glass. Dot Beeson, founder of the sanctuary, said: "The male showed amorous signs towards the female, so once they were fit to go into an outside pen they were placed together. "Initially they had a bit of a lovers' tiff, but now they seem to be lovers again." Trevor Weeks, of East Sussex Wildife Rescue and Ambulance Service, said: "We see so much death, suffering and pain in our work that to see love blossom as a result of our rescues is amazing. "Hopefully Charles and Camilla will enjoy themselves back at the harbour. "I am sure Charles will show Camilla round the rest of the harbour because she has not been here before and introduce her to the rest of the flock that is here."